Hi Nikki, tell us a bit about your story! Food has always been an integral part of my life—my mum is Italian and my dad is Indonesian so as you can imagine, food was a massive part of my upbringing and it’s been a way for family and friends to get together and connect, share stories and exchange human energy—something which I feel we are losing touch of with the increased use of technology and the never ending busy lifestyles that we seem to lead. The health part of it all came later when I was working on my own diet and trying to change my way of eating after noticing that certain foods made me feel ill, or triggered my migraines or skin break outs. I never really grew up with junk food but definitely over ate processed foods in the form of cakes, sweets, breads, pastas and white rice. I obviously didn’t want to miss out on the comfort foods that I had grown up on so I started experimenting with how to make comfort foods healthier and in doing so, it sparked my interest in nutrition. Before I started working on NOOD I actually worked in Human Resources. Cooking was always my form of meditation after a stressful day in the office and one day I decided that I wanted to take the risk of embarking in a career in food. I started working at a really busy cafe as their kitchen hand and over the span of three and a half years I worked up to head cook. During this time, I embarked on my part time studies in Nutritional Counselling and Nutritional Medicine. When I left, I decided to start NOOD and here we are! NOOD will be two years old at the end of November and it’s been a very exciting journey so far. NOOD grew very organically (pardon the pun!) as it started with a simple healthy recipe blog for me to store my recipes and share them with others and then once I finished my studies I decided to expand it into more of a counselling business with events and workshops focused around health and wellness. But in the end it was actually the catering that people really grew to love. 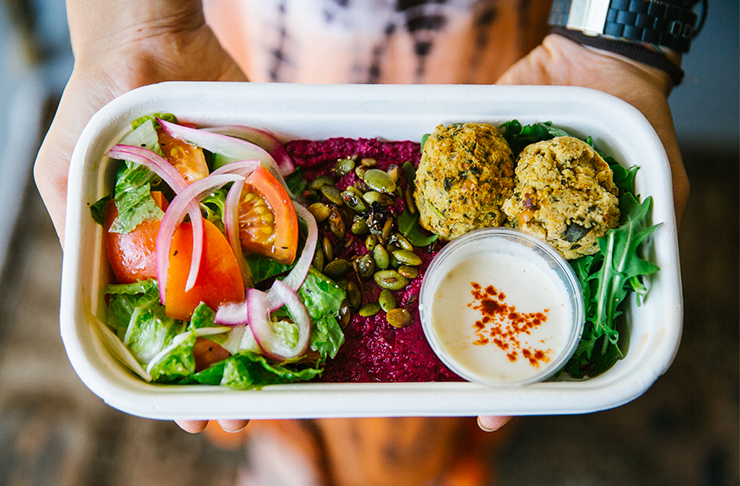 When I discovered that there was a real gap in the market for healthy, whole-food catering, I decided to focus on that more specifically and since then the business has grown at a really steady space. We do event catering as well as grab-and-go options which are stocked at select cafes, gourmet grocery stores and select IGA supermarkets. The events, cooking classes and corporate workshops are still very much a part of the business but it has been finding this niche in the market for healthy options which has allowed for the business to really flourish. Definitely not. As a teenager I wasn’t healthy at all and had an obsession with anything containing pasta, bread or rice. I was definitely a carb lover and it wasn’t until my early 20’s that I realised it didn’t agree with my gut, my skin or my moods! I used to have a pretty fierce sweet tooth and although chocolate is still a vice of mine, I’ll only treat myself to a little dark chocolate every now and then. No two days are the same for me. Monday’s are normally in the office paying bills, getting the week of catering organised and following up on feedback from previous week’s catering. Some days I will be hands on in the kitchen cooking with the team, and others I might be out at a corporate venue public speaking and running wellness workshops or cooking classes as a part of their health and wellbeing initiatives for staff (recent clients have included RAC, The Water Corporation, Ernst & Young and Celebration Homes). I have recently worked with Cable Beach Club in Broome creating their menu plan for their Women’s Wellness Retreats which has meant me flying to Broome a few times a year to partake in the retreat, run a healthy living seminar and engage with the attendees on healthy eating and the NOOD philosophy. I like the variety that comes with running a business and I enjoy all of the different facets that NOOD has as it keeps me busy and always on my toes. Doing something I love every single day. I feel extremely lucky to be able to honestly tell people that I love what I do. I have an amazing team who works with me and they make every single day so much fun and so incredibly rewarding. Mmmm tricky one! Probably still something with food. Or my background prior to NOOD was in Human Resources which I still have an interest in so perhaps working in a larger company and running or designing their health and wellbeing program would be interesting. Yoga—it’s definitely something which makes me feel physically and mentally stronger. It’s a great way to balance out a stressful day. Not to become too overwhelmed. I think there are so many diets out there and so much information which can often contradict each other. So I feel it’s important to just take a step back from it all, learn to listen to and understand what your specific body is telling you and then create a way of eating and living that suits you personally. It’s impossible to undo years of damage in one or two weeks so setting simple, weekly goals which will all add up in the long run is the best way to achieve sustainable health which will then become habit and a way of life rather than a temporary quick fix solution. Probably our kitchen! Haha! The Raw Kitchen in Fremantle do yummy raw treats and ice creams or Whip It Good at the Fremantle Markets make yummy CocoWhip with a whole selection of beautiful healthy toppings. Just continuing to expand the NOOD brand and getting into more places around Perth. We have started running our cooking classes more regularly too which has been really fun and will be putting on a lot more events in the coming months—particularly our Yoga & High Tea event which has been really well received in the past. The NOOD Cook Book is slowly on its way to being released which is probably the most exciting thing happening. A bit more love still needs to be put into it but hopefully in the next few months it will be available for pre-sale. Mrs Browns in North Fremantle is lovely for a wine, Varnish on King is great for a night cap. I love the egg white omelette at Gill Street Cafe & Deli. Uncle Joes Mess Hall on King Street. The view and food at Il Lido in Cottesloe is pretty special or Brika in Northbridge does beautiful Greek food. I don’t really shop much in Perth to be honest…if I can I’ll try and get a trip overseas and do some shopping whilst on holidays.